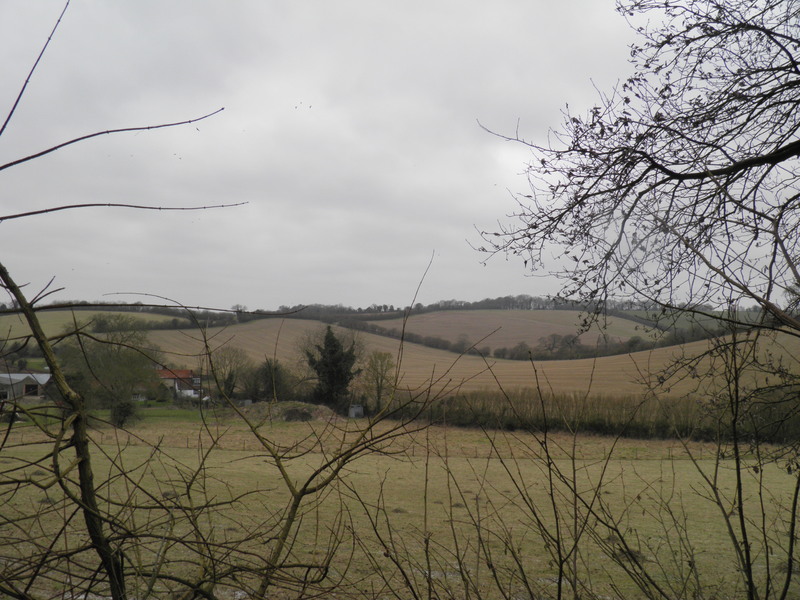 Cris-crossing a valley between Chiltern heights that are sometimes bleak and sometimes well-wooded, this easy but rewarding walk links pretty Bradenham village, West Wycombe Hill with its artefacts of the Hellfire Club and Benjamin Disraeli’s mansion at Hughenden. Underfoot: Generally, this walk is on firm paths, tracks and minor roads. 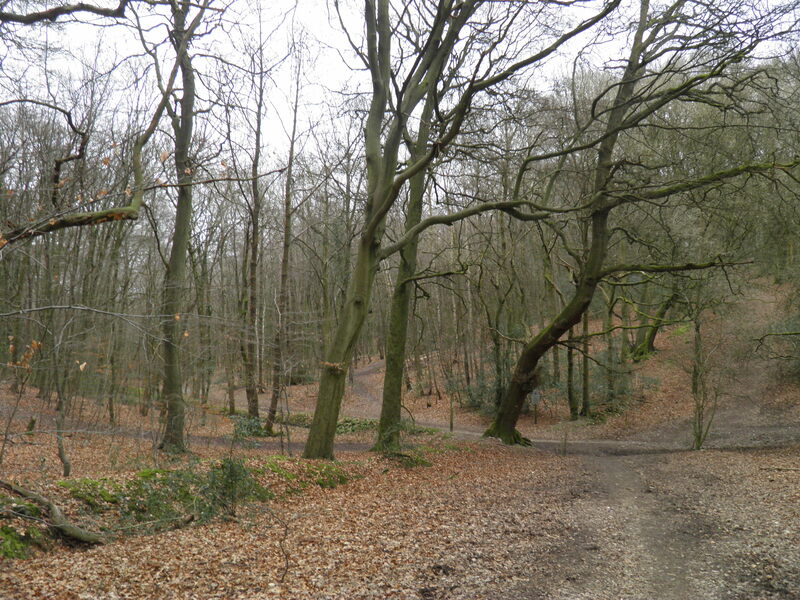 There may be a couple of brief sections of mud in Park Wood before Bradenham and in the valley beyond High Wycombe. Terrain: Plenty of climbs and descents, though mainly reasonably gentle. 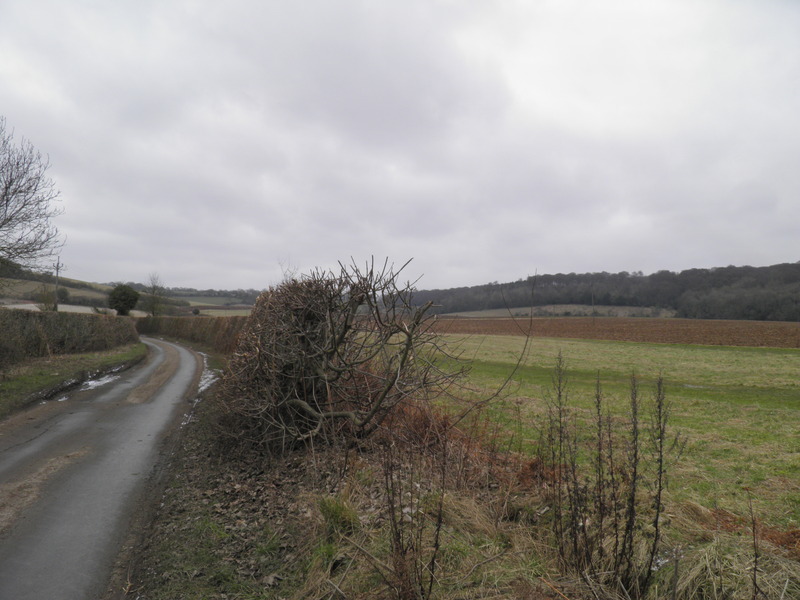 The one notable exception is a short, steep climb beyond Bradenham to the ridge above. Maps: 1:50,000 Landranger 165 Aylesbury & Leighton Buzzard and 175 Reading & Windsor; 1:25,000 Explorer 172 Chiltern Hills East. Useful websites: The route passes through the National Trust properties of Bradenham and Hughenden. 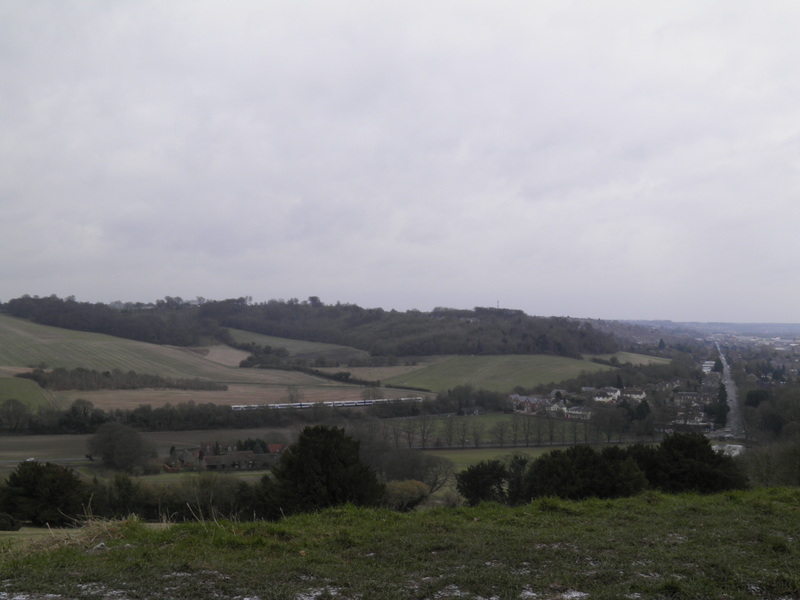 It passes the edge of West Wycombe village and the Hellfire Caves. 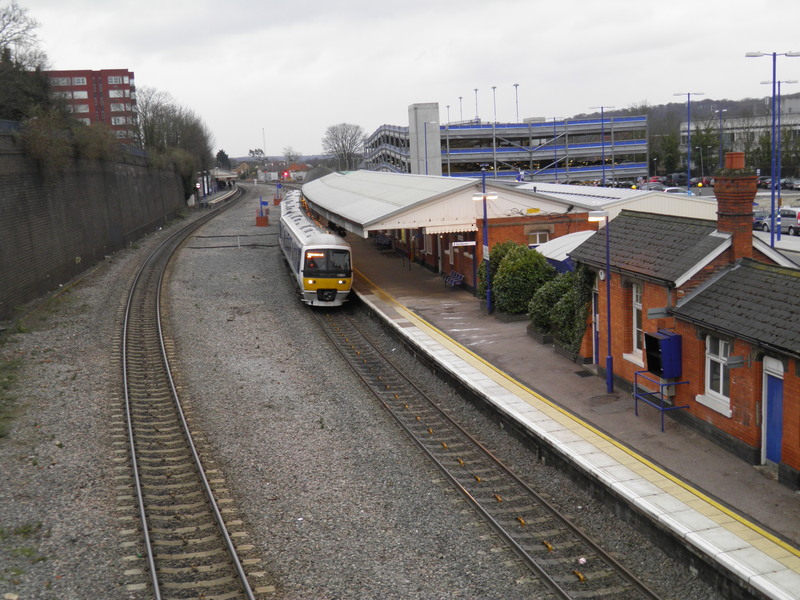 Getting home: High Wycombe has 3-4 trains per hour daily to London Marylebone (28-52 mins). Around 1 train per hour calls at South Ruislip (30 mins) for Central line connections. Fares: A return ticket to Saunderton will cover both journeys. There is only an ‘Anytime’ day return ticket for this journey, costing £18.80 (£9.40 child, £12.40 railcard). 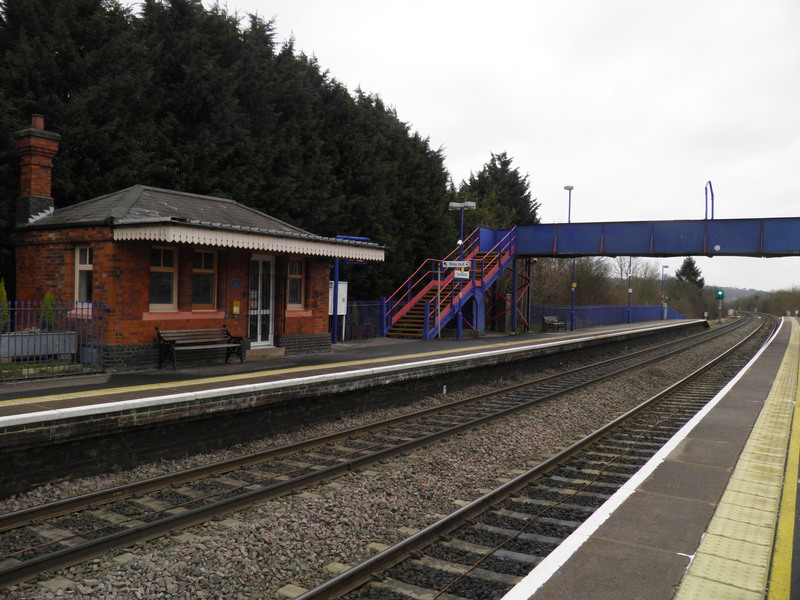 three miles from the station, but is also far closer to the next stop up the line at Princes Risborough. There seems to be some reluctance on the part of Ordnance Survey to name the collection of houses around this station, but it is also known locally as Saunderton. The station, along with the rest of this line, opened relatively late in 1901, and briefly shot to fame 12 years later when suffragettes burned down the main station building, leaving signs saying “Burning to Get The Vote” on the platform. approach. At the bottom turn left again under the railway to reach the A4010. Cross with care and take quiet Smalldean Lane opposite. The lane soon leaves the last few houses and begins to snake between fine hedges, gently climbing, then passing isolated Small Dean Farm, with fine flint knapped houses and wooden barns. About 200m beyond the farm, cut right at a small car parking area  with a National Trust information board, following the footpath sign up a slightly sunken path. bridleway waymark dropping to the right . Soon climbing gently again, the clear path continues along the edge of the wood, with good views back to Saunderton. Eventually, the path curves up into the woods and you reach a slightly muddy junction  where you keep straight ahead on a clear track (bridleway waymark). Keep to this track as it twists through the lovely woodlands, following waymarks straight ahead. 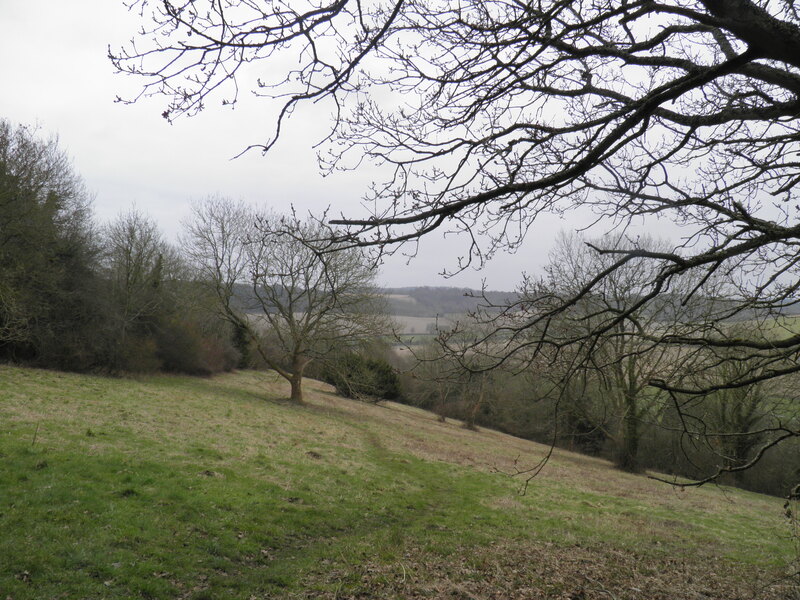 Eventually, the track begins to descend steeply and suddenly emerges from the woods , providing a sweeping view over Bradenham and down the vale. Here take the second of two paths on the left, marked with a National Trust ‘No Riding’ sign, following the field boundary towards Bradenham. beside a fence, still towards the roof of Bradenham Manor. Approaching the houses, a pair of footgates leads you out onto the road opposite Bradenham church. Turning right you immediately come to Bradenham’s huge village green, which doubles as a rather topsy-turvy cricket pitch. The manor house lurks behind the church. 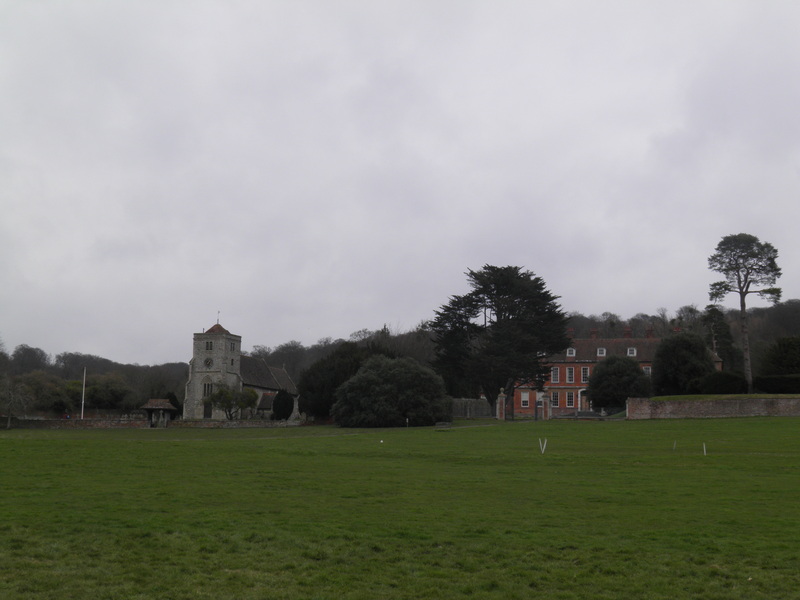 There has been a manor at Bradenham since the 13th century, with the current fine red brick manor house being built in the 17th century. By the 19th century, this was the home of a merchant named Isaac D’Israeli, whose son Benjamin, twice prime minister of Britain, was born here in 1804 and lived here for the early years of his life. His father is buried here in St Botolph’s church. 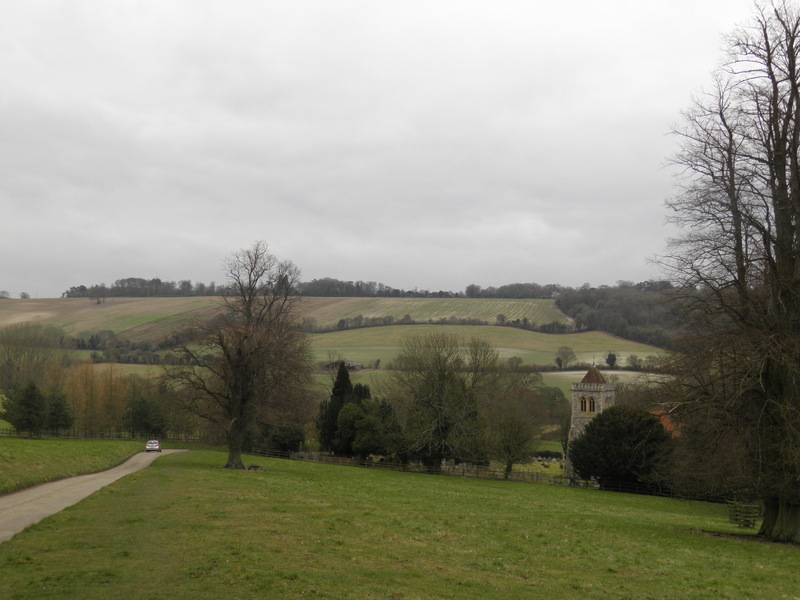 Since 1956, the entire village of Bradenham has been in the ownership of the National Trust. Continue along the road, following the lovely row of cottages on the north side of the green. Past the junction with Rectory Lane and continue ahead to rejoin the A4010, by the Red Lion inn. Cross with care and briefly turn right along the verge. Just before the bus stop, head left through a rusty kissing gate (footpath sign). Head slightly left to pass through another gate just ahead, which leads you under the railway line. As you climb away from the line, turn right through a waymarked footgate and follow the field edge to a waymark post, which sends you left through the edge and a gate. At a second post , follow the path left, climbing steeply beside the hedge. Entering the wood, you continue to climb on a reasonably clear path, to emerge at hilltop Nobles Farm. Head left past the front of the farm buildings onto a fenced, grassy path. This soon becomes a forest track and there follows 2km of pleasant, straightforward walking along the broad ridgetop. Ignore the crossing path waymarked after about 700m. Eventually, descending gently through younger woodland, you pass the boundary of the National Trust land. Emerging into an open space  with the church tower on West Wycombe Hill ahead, cut across the grass towards the car park and church tower. Head for the far right hand corner of the car park and enter the churchyard through a gate. St Lawrence’s is the parish church for the village of West Wycombe, below in the valley floor. There is also a church in the village itself, which was often known as the ‘winter church’, whilst the hilltop site was the ‘summer church’. In its current form, the grade 1 listed church dates from 1761, but this has been a religious location since at least the 7th century AD. The most remarkable feature of the church is, of course, the huge gold ball, 8 foot in diameter, on the tower. Built of a wooden frame and covered in gold leaf, it is large enough to contain seating for six people. 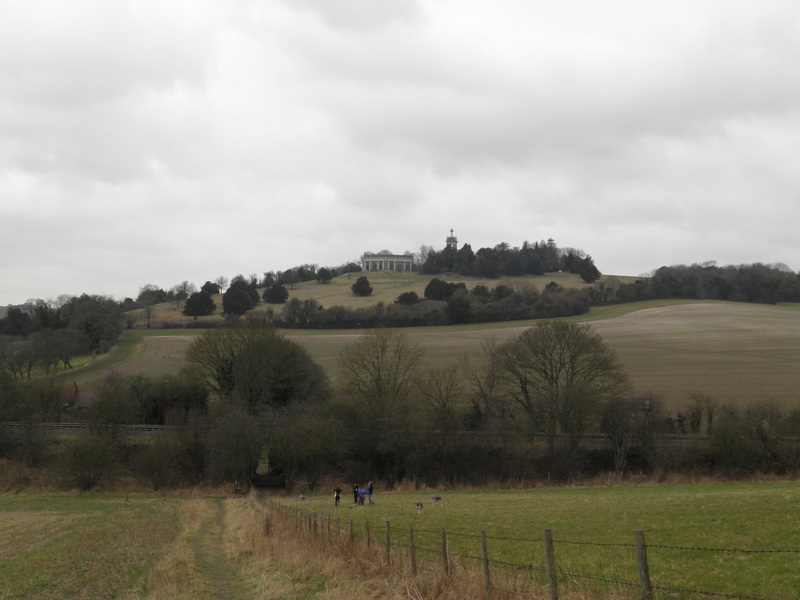 Sadly, there is absolutely no evidence for the widely held belief that members of the Hellfire Club, the high society organisation, which was believed to enable its members – including senior politicians – to partake of ‘immoral acts’, founded by local aristocrat Francis Dashwood in 1719.
right to reach the mausoleum, with its fine view across the park to High Wycombe. This is the Dashwood mausoleum, built in 1765 by Sir Francis Dashwood, of Portland stone and flint, set on the site of an iron age hill fort. The urns around the interior walls of this huge, hexagonal construction house the ashes of members of the Dashwood family, of West Wycombe House. Wycombe and then descend by the broad path straight ahead. Glance right to look across the rooftops of West Wycombe to ochre, paladian West Wycombe House beyond. Steep wooden steps drop right to a small car park  at the entrance to the Hell Fire Caves. 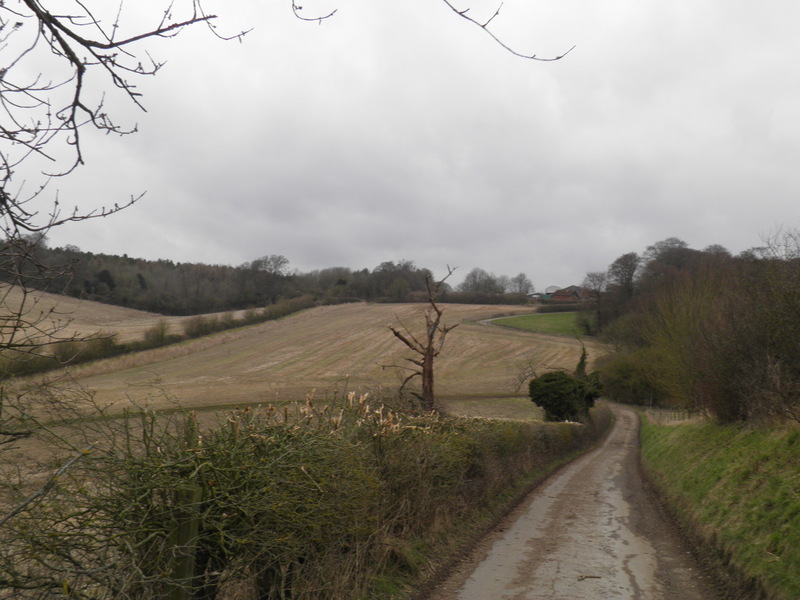 local people, to provide chalk to surface the road from West Wycombe to High Wycombe. Subsequently, they became used as a meeting place for the Hellfire Club throughout the 1750s and early 1760s, following a practice described by Horace Walpole as ‘rigorously pagan’. The caves would have therefore been visited by many of the leading political figures of the day. It is unclear whether Benjamin Franklin, one of the United States’ founding fathers, was actually a member of the club, but he certainly visited the caves as a friend of Francis Dashwood. The club began to decline from 1762, when Dashwood had a brief tenure as chancellor of the exchequer, before resigning after his increase in duty on cider caused near riots. Various exposes of the Club, along with deaths of many of its members, led to it being defunct by 1766. 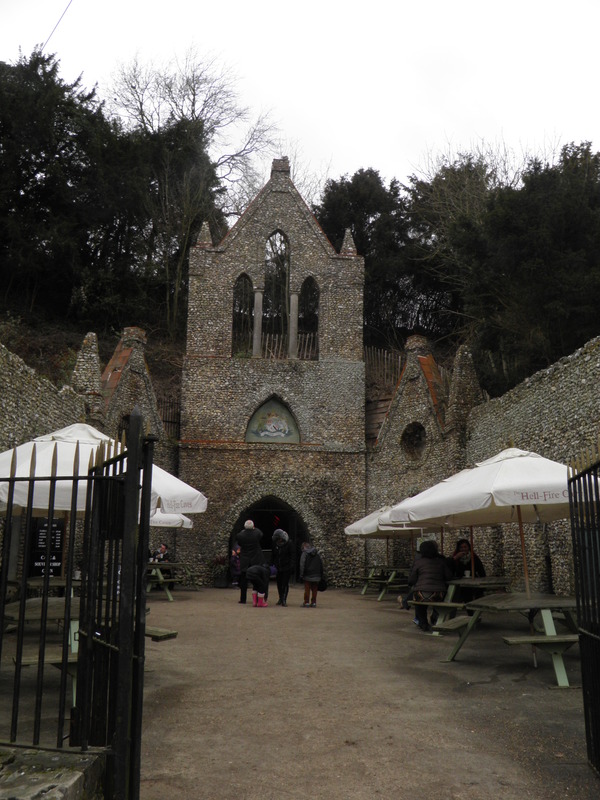 The caves sat empty until the 1940s, when another Francis Dashwood renovated them and opened them as a tourist attraction in order to fund the renovation of West Wycombe Park. Join the small road and head left. Just after the junction with Church Lane, turn right at the FP sign . halfway down the field, pass right through a kissing gate and continue in same direction on the opposite side of the fence to pass the farm and rejoin the A4010. Recross the main road one final time and take the path opposite, across a sometimes muddy field to a well hidden bridge under the railway. Under the bridge, cross the stile and take the path heading straight ahead up the hill. 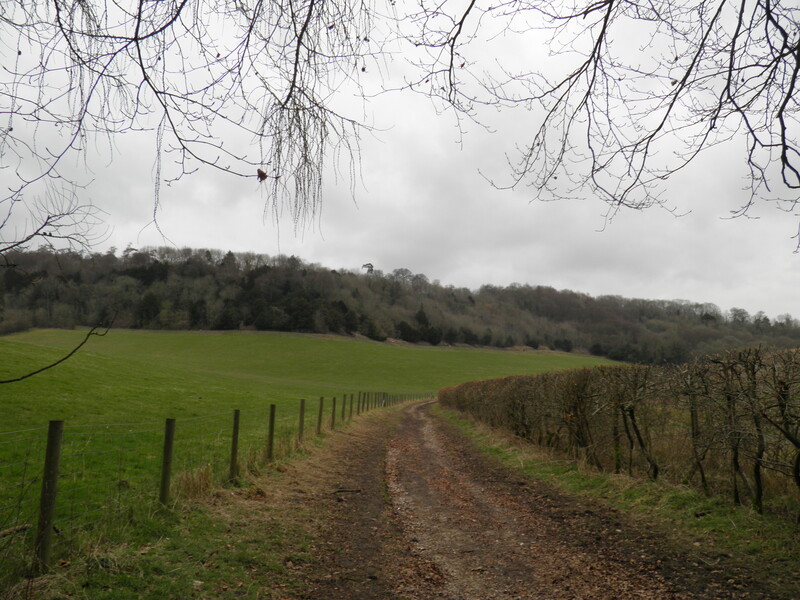 The path passes over the low hill, with fine views back to West Wycombe Hill, eventually dropping to a track in the valley bottom. Cross the track and keep straight ahead on a path climbing towards stables on the hilltop ahead. Cross the forecourt of the stables to join a surfaced track , keeping straight ahead up the small valley. Where the track drops to the edge of a wood, follow the footpath sign ahead into the trees on an unsurfaced track. This leads you up the grassy floor of a small wooded valley, climbing gently to eventually reach a waymark post . Here head right on the clear path climbing out of the valley. Clear of the trees, the path continues straight ahead beside the hedge over the hilltop. 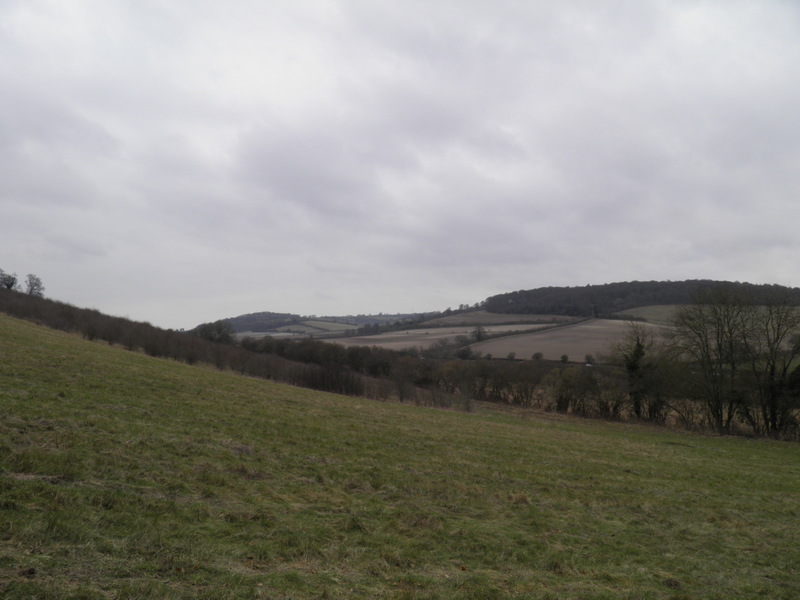 It might come as a surprise to now be looking down on West Wycombe Hill! Eventually, at the end of the field, a footgate leads you into a smaller field and to the cottages of Downley Common. Emerging on a road, turn left, and follow it round the edge of the common. At the junction by the parish notice board , turn right on a poorly surfaced road along the row of houses. cut straight ahead on a path, following a footpath and bridleway waymark post ahead, descending into the trees. The clear path descends gently through the beeches to reach a multi-path junction by a National Trust sign. Here turn left on the path beside an often dry channel, dropping gently. Before long you emerge from the woods and follow the track ahead descending a lovely dry valley. Keeping ahead on this track, you come to the corner of a wood and follow the track as it swings slightly uphill into it. Keep to the main track as it snakes uphill. After a particularly steep section you reach a signpost , with Hughenden Manor’s icehouse to your left. Keep SA on the armac road to emerge by the walled garden, shop and cafe, with the manor itself to your right. 1840s he was beginning to consider his prospects as a future leader of the Conservative party. It was unthinkable in the then Tory party that their leader should not represent a ‘county’ seat, and to do so it was necessary to be a landowner. Disraeli therefore secured a loan to buy Hughenden from an ally and brother of a former leader of the party, Lord Henry Bentink, enabling him to stand and be elected for his birth county of Buckinghamshire. Achieving the leadership took somewhat longer than he expected, and the only offices Disraeli held during the 1850s were two short spells as chancellor under Lord Derby. 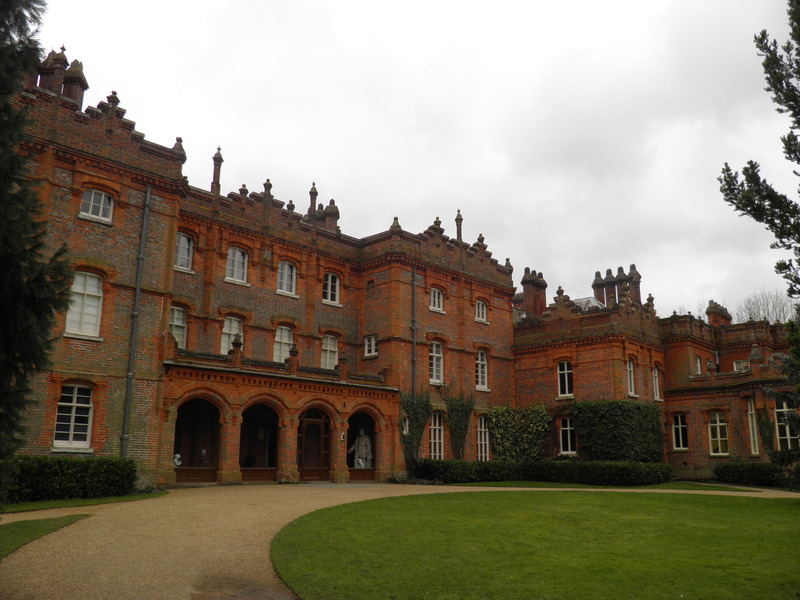 In 1862, he had Hughenden remodeled to the form we see today, in a hybrid baronial form of Gothic architecture. Disraeli eventually rose to the party leadership and, briefly, the premiership, in 1868, with a longer spell in office from 1874 to 1880. 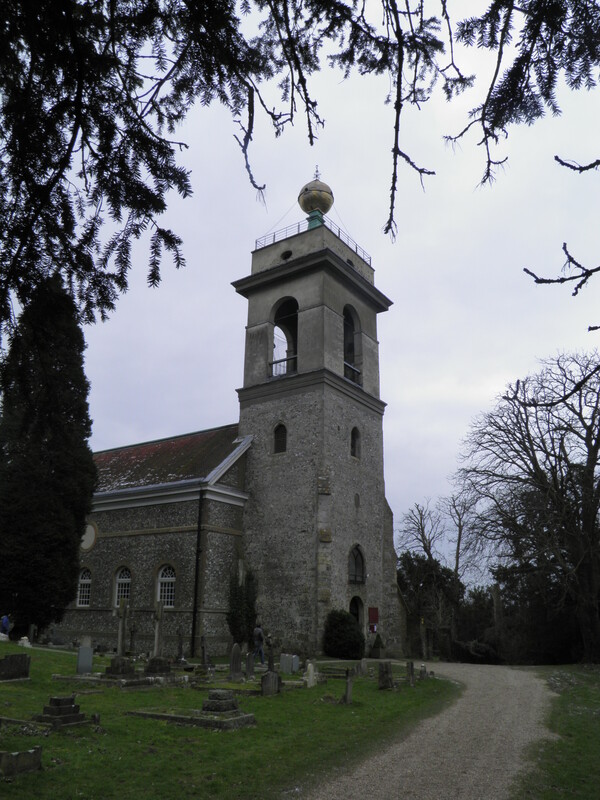 Hughenden remained his home until his death in 1881, and he is buried with his wife in St Michael and All Angels church below the house, with a memorial erected by Queen Victoria inside the church. 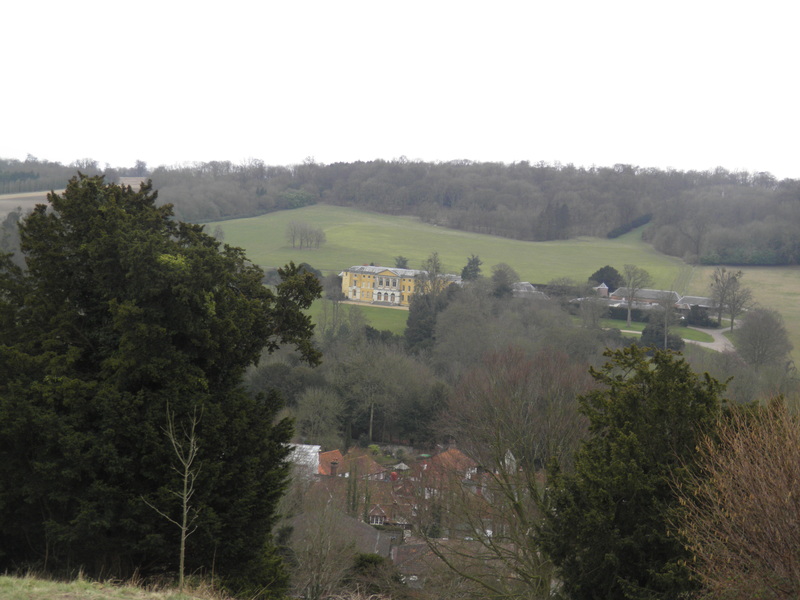 During World War 2, Hughenden was a secret intelligence base, codenamed ‘Hillside’, used for the analysis of aerial photographs of Germany and preparing maps for bombing raids, including the Dambusters. The house and grounds were passed to the National Trust in 1947.
immediately after, just above the estate church, follow the signpost right (‘High Wycombe’). A faint path cuts across the fine parkland towards a footgate in the distant fence. Beyond the fence, keep ahead through more parkland, heading for Middle Lodge, halfway up the hillside. Pass through the kissing gate next to the lodge  and join the avenue of young trees dropping gently ahead. Follow this avenue all the way to a road beside what is currently a large building site. Keep straight ahead on the pavement and where the road swings sharp left, cross and take the tarmac footpath ahead. Emerging at another road, head left, cross at the traffic island and take the path on the right opposite Rynn Close. This is a very urban path, but does have the advantage of a clear running stream beside it. After crossing the stream, the path runs behind garages to emerge beside a roundabout. right on the next road off the roundabout, quickly left on Benjamin Road, then immediately right on Priory Avenue. Keep straight ahead at the crossroads by Hamilton Primary School. The road swings left beside the railway line, passing Wycombe Museum in its gardens on the left. At the end of the road cross at the pedestrian crossing and turn right over the railway bridge, and then immediately left to reach High Wycombe station.